SMCA presents Feed the Soil Compost for your gardens. Bring your bags and shovel to get FREE compost from The Calgary Composting Facility, the largest of its kind in Canada. The facility produces high quality compost collected from the green cart program and the biosolids program. The benefits of using compost in your garden are numerous. It builds good soil structure; enables soil to retain nutrients, water, and air; protects against drought; helps maintain a neutral pH, and protects plants from many diseases commonly found in the garden. THANK YOU TO BIG MAN LANDSCAPING! Compost is a great way to provide natural, organic nutrients to your lawns, flower beds/pots and trees. Here are some common questions we get all the time that may help you when using compost for your yard. How do I spread compost? 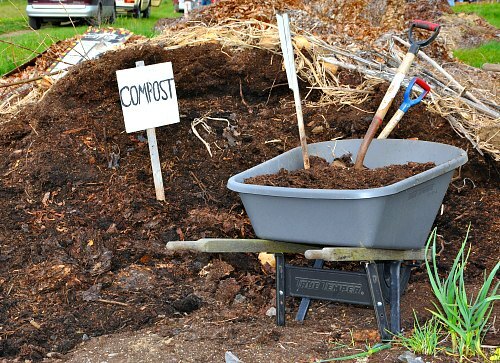 There are various ways to use your finished compost. You can sprinkle compost on top or mix it into your flower and vegetable beds, gently rake compost into tree beds, blend it with potting soil to revitalize indoor plants, or spread it on top of the soil on your lawn as a soil amendment. Before planting seeds or seedlings, spread 2 inches of compost over the garden area, then till the compost into the soil at a depth of 6 to 8 inches. For large gardens, conserve limited amounts of compost by adding one trowel’s worth of finished compost into each planting hole. Can you use compost instead of potting soil? When should you put compost on your garden? Some people recommend late fall as a good time to spread compost over a garden bed, and cover it with a winter mulch, such as chopped leaves. By spring, soil organisms will have worked the compost into the soil. Others recommend spreading compost two weeks before planting time in the spring. Does compost help plants grow? In loose, sandy soil compost helps to bind these particles together and increase the soil’s ability to retain moisture and nutrients. … Compost also adds nutrients to your soil. Compost contains a variety of the basic nutrients that plants require for healthy growth. Can I use compost for my lawn? You can use compost to top-dress both new and existing lawns. On a seeded lawn: After sowing lawn grass seeds, apply a thin layer — about 1/4-inch — of compost as top-dressing to help maintain consistent soil moisture while seeds germinate and tender grass seedlings get established. Is compost good for trees? Organic mulch, such as that derived from compost, has all the usual benefits in addition to supplying nutrients to the soil as it decomposes. On beds of permanent plants, trees, hedges, and fruit, an annual mulch of compost will keep your soil in good health and your plants in top condition. Hopefully these answers will help with your beautiful yard this growing season. Have fun! The Sandstone MacEwan Community Association website is your source for news, events, notices and updates for everything happening in the Sandstone and MacEwan Communities. You can also join and pay membership fees on the site and browse galleries from past events and contact us for any assistance in our community.